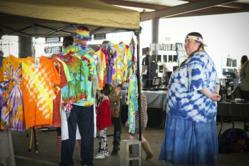 A vendor sells shirts at the 2011 Texas Avenue Makers Fair in Shreveport. The Texas Avenue Makers Fair invites non-traditional crafters, or "makers," to offer their handmade and re-purposed items for sale to the public. During the Texas Avenue Makers Fair, local musicians and artists will perform for the entertainment of shoppers. Shoppers are advised to bring cash, as many vendors are unable to accept checks or credit cards. The Texas Avenue Makers Fair is a family-friendly event. For more info, visit http://www.texasavemakersfair.com, email makersfair(at)texasave(dot)org or call 318-762-8946 to speak with an event coordinator. This edition of the Texas Avenue Makers Fair will coincide with the ASEANA Spring Arts Festival, which will take place in the Asian Gardens located at the corner of Milam Street and Texas Avenue, 11 a.m.-5 p.m., Saturday, April 14. Both events celebrate art and culture and are free to attend. For more information on these and other events taking place in Shreveport-Bossier, visit http://www.shreveportbossierfunguide.com. NOTE TO MEDIA: A gallery of print-resolution images from the Spring 2011 Texas Avenue Makers Fair may be viewed or downloaded here.